For the past 20 years, Pantone’s Color of the Year has influenced product development and purchasing decisions in multiple industries, including fashion, home furnishings, and industrial design, as well as product, packaging and graphic design. In this interview, Leatrice Eiseman, Executive Director of the Pantone Color Institute, explains why brands should pay attention to colour trends. TM. How does Pantone go about identifying its Color of the Year? LE. To arrive at the selection each year, the global team of colour experts at the Pantone Color Institute comb the world looking for new influences. This can include the entertainment industry and films in production, travelling art collections and new artists, fashion, all areas of design, popular travel destinations, as well as new lifestyles, play styles and socio-economic conditions. Influences may also stem from new technologies, materials, textures and effects that impact colour, relevant social media platforms and even upcoming sporting events that capture worldwide attention. Since we selected our first Pantone Color of the Year in 2000, Pantone’s Color of the Year has influenced product development and purchasing decisions in multiple industries. TM. What led to Living Coral being this year’s choice? LE. As the selection for 2019, which commemorates the 20th anniversary of the Pantone Color of the Year, Living Coral represents the enhanced influence that colour has on perception and experience, more powerful than a fleeting fad. As a shade that affirms life through a dual role of energising and nourishing, Living Coral reinforces how colours can embody our collective experience and help to answer the needs of society and culture. Colour is no longer just something we see and appreciate – it enhances and influences the way we experience life. Reflecting on the Pantone Color of the Year at its 20th anniversary, this evolution is clear. Colour, as a strategic element of design and experience, can be the reason why something – whether it be a product, a piece of art, a setting, or a brand – resonates or not. TM. Which colour do you expect to be on-trend next? LE. Spring/Summer 2019 colour trends will reflect our desire to embolden ourselves as we face the future; turning to colours and colour stories that provide confidence and lift our spirits; embracing a colour and design direction filled with creative and unexpected combinations. TM. To what extent do you think that colour trends reflect wider social trends? LE. Colour trends inherently connect to cultural trends and moods as they serve as both a reflection of where we are as a society, as well as a prediction for what’s to come. They seek to answer the question ‘what are we missing?’ The answer to that question is a shade that is gaining importance around the world and makes us feel more connected and engaged with the zeitgeist. The Color of the Year, for example, exists on a more macro global plane, apart from political discourse. TM. How have colour trends evolved over the years? LE. The biggest change in tracking trends is that fashion was always the definitive forerunner. Now we look at the larger macro picture, where there are many other influences that we must observe. Another big change is that colours are not as easily “abandoned”, where they might be used for several seasons and then they seem to disappear. The best historical example is the overuse of the avocado greens in the 70s that led to the non-use of that shade through most of the 80s and even the 90s. However, since the late 90s – and certainly into this century – there is some variation of every colour family in the spectrum that might appear in upcoming trends. That is because there is far more innovation and experimentation with colour, especially in colour combinations. TM Is it important for brands to get on board with colour trends? LE. Colour is the first element of design in both product and living environments that the human eye sees and relates to on an emotional level. In addition, colour leaves the most lasting and memorable impression. For consumers, colour influences up to 85% of product purchasing decisions, making colour a critical consideration for brands looking to communicate certain messages or motivate certain behaviours. 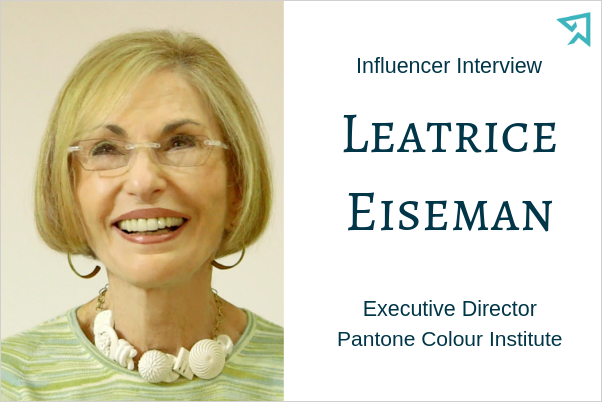 Leatrice Eiseman is a color specialist who has been called “the international color guru.” Her color expertise is recognized internationally, especially as a prime consultant to Pantone, the leaders in color communication and specification. She has helped many companies to make the best and most educated choice of color for product development, brand imaging, interior/exterior design, fashion and cosmetics, or any other application where color choice is invaluable to the success of the product or environment. Lee is also involved in color and trend forecasting across multiple industries.